A few photos from yet another memorable one! 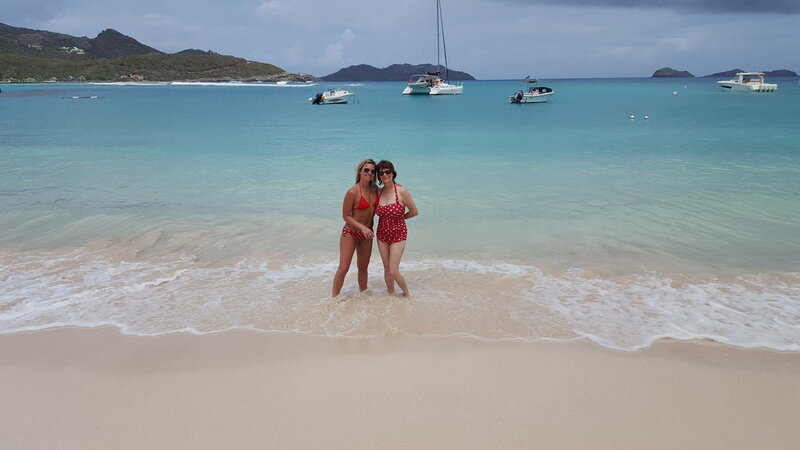 For our God-daughter, Heidi it's her 7th trip, she tells us she is "completely hooked" on St Barts! First day, my wife Caroline and Heidi heading off to their spa appointment. Caroline later in the trip at the Cheval Blanc Spa down from the villa with her favorite person. This was such a great time, we spent the afternoon with friends (along with new ones) on a Catamarran ride, swimming, eating, paddle boarding and as you can see here the ladies dancing. We had a beautiful lunch and spent the rest of the afternoon by the gorgeous pool at the new hotel, Le Barthelemy on Grand Cul de Sac. It's one of the most beautiful settings on the island and the staff here is tops. Diana, closest in the photo is our Villa Manager and came along with us this nice afternoon. Our next open full open week is June 26 –- Summer is great on St Barts, uncrowded, very European...we also have a few days open at the end of May. Contact me for details! Caroline & Jeff's Polar Vortex trip! Caroline & Jeff's post Irma Vacation. © Copyright 2016 Jeff McGrew. All rights reserved.